Peter Turner by Neil Penman. This article on Tony Ray-Jones, written by the late Peter Turner, appeared in the July 1988 issue of Creative Camera magazine. In the early 70’s pictures and attitudes made visible by the late Tony Ray-Jones gave young photographers a fresh set of hopes for their medium. 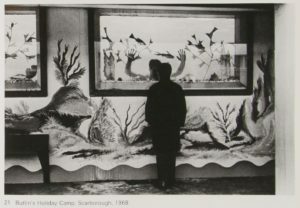 Searching for a new and British photo-cultural identity, people like Martin Parr and Homer Sykes were impressed by Ray-Jones’ ability to make pictures of a quality and kind they found stunning. In their own back-yard, as it were, he introduced ideas of intelligence and independence into a regime dominated by a value system based on the mythic powers of the globe-trotting, high-flying photographer with a Life magazine assignment. 16 years after his death Ray-Jones’ influence still looms large, transformed by time from visual imitation to a more mature understanding of how he defined the photographer’s role. To borrow words now more than 20 years old from his mentor, Alexey Brodovitch, ‘the problem of the photographer is to discover his own language, a visual ABC. The picture represents the feelings and the point of view of the intelligence behind the camera. The disease of our age is boredom and a good photographer must combat it. The way to do it is by invention – by surprise’. Seen in 1988 it is difficult to remember how surprising Ray-Jones’ pictures were. But they marked a clear beginning for a return to vitality in our photographic view of England . That they are again going on public view is a testament to their endurance, for when the surprise is calmed by time we are left with content, and a sense of authenticity. The essay following has been edited from an introduction to a limited edition portfolio published by Photographic Collections in 1975. The photography of Tony Ray-Jones is unlike any other that we have in England – a rich fusion of American and European visual influences brought to an essentially British understanding of the whimsies of human nature. His pictures, as carefully structured as a painting by Breughel, have the fluid rhythm of an inclusive perception: they are incisive, witty and dominated by a tightly controlled sense of the bizarre. From his earliest work onwards he discovered a particular affection for the gentle, often comical foibles that revealed his subjects as being supremely individual. Even if they were simply figures in a landscape to each was accorded a sense of presence that at once marked them with Tony’s own understanding of the reality of the human condition while leaving their dignity intact. In the major body of his work he can be observed moving swiftly between the anachronisms of a race left breathless by rapidity of urban change and the kitsch facade that forms a surreal backdrop to their bewilderment. But it is within his portraits that lie the strongest clues to Tony’s humanity for they contain a combination of honesty, tenderness, respect and visual power. Knowing this facet of his work, one can begin to realise the subtleties of his vision when applied to the social landscape, and begin to understand and appreciate the nature of his concerns. Unlike so many contemporary photographers who share Tony’s fascination for the eccentric in us, his vision, always humorous was sharp without being barbed. Without doubt his death from leukaemia in 1972 ended the work of one of England ‘s greatest photographers. Had he lived, Tony would have become an even more important and influential figure. As it is, during the latter part of his life and since his death his work has become known and admired by many young photographers who continue to be stimulated by the rich eclecticism of its content and the visual deftness of its execution. 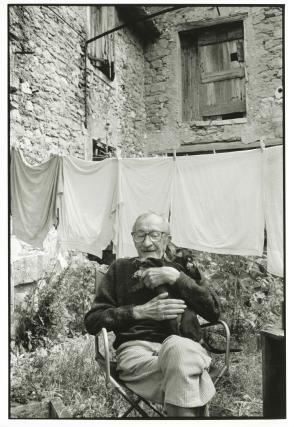 Tony Ray-Jones was born in Wells, Somerset , in June 1941, the son of Raymond Ray-Jones, a distinguished painter and print- maker. At 16 he went to the London College of Printing to study graphic design. Photography was included as part of his course, and Tony found this a particularly stimulating medium. He bought an elderly camera and began to take photographs, falling especially under the spell of Bill Brandt’s early work which was exhibited at the College. While still a student he showed some of his prints to Brandt, whose brother taught at LCP. ‘They made Brandt laugh a little, they amused him and he said to get in closer’. However, Tony’s talents were not restricted to photography and in 1960 he won a two year scholarship to Yale University in the United States for a graduate design programme with colour. There he studied with Joseph Albers. But despite the stimulus of his environment he began to grow bored with design and began to concentrate more completely on photography. At this stage his life reached a turning point when he encountered the now legendary Alexey Brodovitch for the first time. Brodovitch, one of the most original and creative forces in American design and art direction came to Yale to lecture and Tony was completely absorbed by his charismatic personality. Tony began to commute to New York City where Brodovitch ran The Design Laboratory. Students and ex-students included Irving Penn, Art Kane, Robert Frank and Garry Winogrand. Tony joined Brodovitch as Associate Art Director of Sky magazine and shortly afterwards began to freelance as a photographer. His time spent in America was exciting and stimulating in a way which he had never experienced in England . The loneliness and aggression of the American way of life as well as its vitality had a profound and maturing effect on his vision. However, the inflow of influence was not restricted to still photography; writing in Creative Camera in October 1968, Tony cited as equally important the films of Jean Vigo, Bunuel and Fellini, and it was from this area that he gained much of his visual education. Ainslie Ellis, writing in the British Journal of Photography Annual 1973 mentions also his passion for the Marx Brothers, Charlie Chaplin and Jacques Tati, and the gentle madness of these characters can be seen to have permeated his photographs. Joel Meyerowitz, of his time working with Tony Ray-Jones in the US in the early 1960s. In 1966 Tony returned to England . His arrival here both elated and depressed him for while England lacked the almost frenetic interest in visual media that had stimulated him so much in America, he felt that he now possessed the fresh vision of a stranger to this island and was eager to begin exploring photographically virgin territory. He began working on a project that was to occupy most of his time for the following years – recording the English at leisure. Naturally he was also committed to earning a living and he undertook assignments from several sources, notably The SundayTimes Magazine. When he worked on a story his priorities were firmly established in the direction of the subject – not the whims of the magazine’s art director – and this inevitably led to friction. Tony’s commitment to a photograph without compromise also often led him to be at loggerheads with his fellow photographers; in comparison many of them appeared dilettante, and his energy, enthusiasm, dedication and complete disregard for what he described as ‘phoney baloney’ was a source of discomfort to several otherwise respected figures. His major project soon began to take shape as Tony felt his way into the spirit and mentality of the English, and the years 1966-7 were tremendously productive. He bought a VW camper van which gave him the freedom to travel and spend weeks at a time visiting seaside towns, old customs and social events, always seeking that peculiar and particular combination of surreal humour and gentle pathos that he found imbued in our national consciousness. As the project progressed the photographs become increasingly complex, many encompassing great geometry. Always the images dealt specifically with humanity; that which could be made visible in the relationship of apparently trivial but revealing gestures and detail that built towards a climax as his subjects and their environment were unified as a single statement. The work continued through 1968 and in April 1969 Tony had his first exhibition at the Institute of Contemporary Arts , London . Despite the acclaim of his exhibition, Tony was still conscious of shortcomings in his images. Reading project notebooks that he kept during this period I came across a page headed Approach on which he had given himself instructions ‘Get more involved’, ‘Stay with the subject matter (be patient)’, ‘Take simpler pictures’, ‘Get in closer’, ‘Don’t take boring pictures’. This final directive, typical of his continuing self-criticism is indicative of an attitude that dominated his concept of the possibilities offered by photography. Tony sought to unite the gap between public fact and private reality in an entirely visual manner. ‘Photography can be a mirror to reflect life as it is. But I also think it is possible to walk like Alice through the looking-glass observe the puzzles in one’s head and discover another kind of world with the camera’. Soon after his exhibition, Tony ran into financial difficulties and was forced to devote more of his time to commercial work, with resulting decline in his personal photography. In 1971 shortly after his show at the Rencontre Gallery, Paris , Tony, with his wife Anna left for the USA to take up the offer of a job as Visiting Photography Lecturer in the San Francisco Art Institute. His experience with teaching was, however, not what he had expected. Brent Sikkema, a graduate student commented: ‘His foremost concern was always with a social responsibility of the artist to society rather than an elite group of sympathetic artists. His direction was often misunderstood…’. Nevertheless, Tony’s commitment to his own form of expression remained strong and he became particularly involved with the plight of the American Indian. This last project was still in the planning stage when, in February 1972, he learned that he had leukaemia and had only a short time to live. Almost immediately he returned to London and entered hospital. It is perhaps a strong indication of the true nature of Tony’s character that his impending death was treated more as an annoyance than an absolute threat. Believing that he had two years of life left, he began to plan the final stages of a proposed book on the English, (A Day Off: An English Journal published posthumously) and he spoke optimistically of the possibilities and new perspectives opened up by this radical change in his life. However, these two years were not to materialise and on March 13 1972 he died. The dry facts of a person’s life can do little to communicate their personality accurately. For myself, I have many recollections but the strongest is that of Tony’s amazing ability to transmit his own joys and excitement at some new discovery – to him I owe my first encounter with many photographers and fine photographs. For this and for many other reasons I am pleased that his photographs continue to be seen; they are an affirmation of life by someone who enjoyed the human race. East Kent was one of Tony Ray-Jones’s favourite working locations and photographs of Margate, Ramsgate and Broadstairs feature prominently in the exhibition Tony Ray-Jones and The English.Accompanied by an illustrated catalogue with an essay by Gerry Badger, the show is at Ramsgate Library, Guildford Lawn, from 2 to 30 July 1988. It then tours to three other libraries in the area: Gillingham August 6 – September 3, Folkestone, September 10 – October 5, Maidstone , October 22 – November 19, then Photogallery, St Leonards December 1 – 31 and Derby College February 13 – March 18 1989.